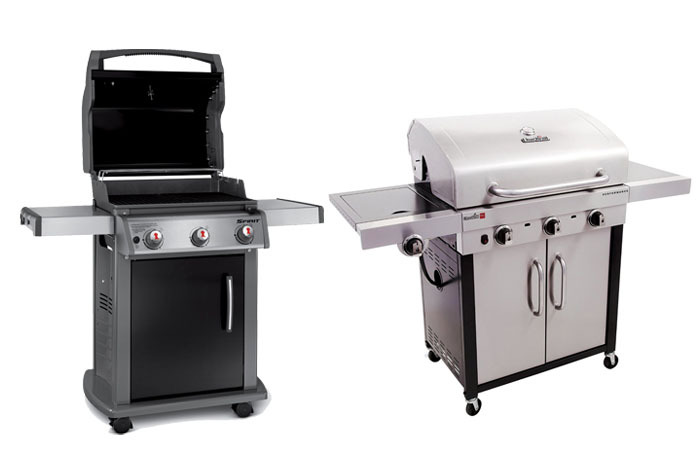 If you are looking for a three-burner gas grill for your outdoor parties, you may end up confused in choosing between Weber Spirit E-310 and Char Broil Infrared. Both are quite similar in terms of the basic specifications, yet Char Broil Infrared is available at a slightly lower price than Weber Spirit E-310. So, which is the model that actually holds the best value for the money? Before you make a hasty decision, read the comparisons first! One of the most important factors that you need to consider in choosing the right gas grill is, of course, the cooking performance of the grill. Quite interestingly, Char Broil Infrared comes with a bulkier body due to having wider cooking area compared to Weber Spirit E-310. Char Broil Infrared offers a total primary cooking area of 500 square inches and with a warming area of 180 square inches. On the other hand, Weber Spirit E-310 only has 424-square inch primary cooking area and 105-square inch warming area. Needless to say, a larger cooking area allows you to cook more ingredients at once. However, you should not forget to take into account the heating power that the grill offers. Char Broil Infrared’s main burners only have 27,000 BTU whereas Weber Spirit E-310 offers a heating power of 32,000 BTU. As the effect, the Weber model can actually cook faster. Unfortunately, though, Weber Spirit E-310 does not come with any side burner. A side burner can be very handy for a multitude of purposes, allowing you to perform more tasks simultaneously. Char Broil Infrared comes with a side burner, which offers 10,000 BTU heating power. Even though Weber Spirit E-310 lacks a side burner, a lot of people love this model because of its excellent cooking performance. Besides having higher heating power, Weber Spirit E-310 also features the Flavorizer bars. The feature functions to collect drippings to be then soared to add flavor, while the unvaporized part can then be discarded into the grease management system to prevent clogging. Both models have been equipped with built-in thermometers. They rely on liquid propane tanks to operate. Weber Spirit E-310 comes with a fuel gauge to inform you of the remaining amount of fuel left in the tank. Both models are great. Char Broil Infrared actually makes an excellent choice if you have a limited budget, because it comes with a larger cooking area and a side burner. However, for the best cooking performance, you should choose Weber Spirit E-310.